Royalists and government buildings raised their flags, and the royal yacht was sporting its own festive signal flags on Monday. It was Princess Ingrid Alexandra’s 15th birthday, and she topped the palace’s own website. “Gratulerer med dagen, Prinsesse Ingrid Alexandra!” read the congratulatory headline, along with a new portrait of the second-in-line to Norway’s throne behind her father, Crown Prince Haakon. 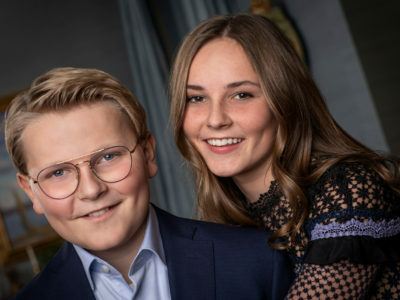 She posed with her younger brother, Prince Sverre Magnus, who turned 13 last month. She was born on January 21, 2004 at the National Hospital in Oslo, where her father started years of trying to protect her from the media glare. He kept reporters busy in a meeting room while his new baby and wife, Crown Princess Mette-Marit, ducked out a back door and headed home. The couple also started posting their own carefully selected photos of the princess, who’s destined to become Norway’s first queen as monarch, instead of letting the press do the job. Media coverage of the royals has waned somewhat since. There’s hasn’t been a lot of coverage of Ingrid Alexandra, except for times like when her parents took her out of the local public school and enrolled her in the private and expensive Oslo International School in Bærum, where most classes are conducted in English. Critics called that a sharp departure from tradition in egalitarian-minded Norway, that sent a bad signal to the public. The palace announced last week that Ingrid Alexandra will undergo a traditional confirmation ceremony on August 31. Her godmothers and godfathers have been invited to the ceremony, to be held in the chapel at the palace, and they include Crown Princess Victoria of Sweden, Crown Prince Frederik of Denmark and King Felipe VI of Spain. Norway’s royal family will all be in attendance. There were no official statements regarding birthday celebrations on Monday, but newspaper VG reported they were likely to include pastries in bed in the morning, accompanied by the Norwegian birthday song Hurra for deg (Hurrah for you), and a family party in the evening at the crown couple’s royal estate in suburban Asker. Her grandparents King Harald and Queen Sonja were expected to “of course” be taking part.